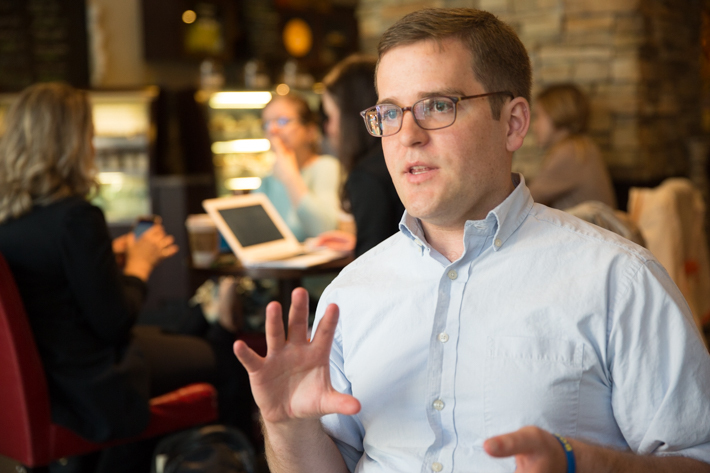 Tech-savvy alum Tom Barry uses World Health Organization research to build a personal brand and impress on-campus recruiters. Tom Barry, a recent graduate of the George Washington University, begins his job as a consultant at Deloitte in July. A week before graduating from the George Washington University, Tom Barry sat on a sofa at the bustling 21st and L Bourbon Coffee café and described a spring afternoon studying in Science and Engineering Hall. Mr. Barry had a simple answer: GW’s On-Campus Recruiting program (OCR). “Choosing a college is about finding an experience that fits but also about finding career opportunities,” Mr. Barry said. “D.C. is an urban campus, but it is right next to Fairfax County where hundreds of tech companies are based, which means that on-campus recruitment is broad in scope. Mr. Barry’s advice came from his experience as an undergraduate student in the Elliott School of International Affairs where he channeled a burgeoning interest in health and technology into academics, research and internships. His diverse experiences won over on-campus recruiting representatives from Deloitte when he interviewed last fall. He’ll start his job as a business technology analyst at Deloitte in July. Determined to expand his knowledge base, Mr. Barry traveled to Geneva, Switzerland, during the fall of his junior year to study in the global health program at the School of International Training. While interning at the World Health Organization (WHO), he began researching mobile health technology— “basically anything with a wireless connection that supports health systems,” he said. Mr. Barry continued his research independently during the spring semester in Dakar, Senegal, where he lived with a host family in a small home that was often without electricity. He reached out to WHO contacts he’d made during his internship and was given the opportunity to present his research to the United Nations and the Senegal Ministry of Health. Mr. Barry said that developing a "personal brand" and taking advantage of GW's On-Campus Recruiting Program helped him land a coveted position at Deloitte's D.C. office. By the summer after his junior year, Mr. Barry was ready to get serious about the job search. What was his next step after identifying consulting as a vocation? Logging into the GWork portal to complete orientation for the Center for Career Services OCR program. The OCR introduction and training prepares students to search participating employers and schedule interviews on campus. Students are granted access following an online assessment of their understanding of the program. After submitting a resume and selecting employers to interview with, students are notified whether they have been invited for an interview. Mr. Barry said that he was also able to talk with Ms. Langford about his fear that “not being a math whiz” would hold him back from the analytical work he wanted to pursue. But she advised him that most companies are looking for recent grads who are willing to learn the skills they need to be successful. Looking ahead to his new position, Mr. Barry said he is glad that his GW journey included classic “only at GW” experiences such as working on The Globe, the student-run international affairs magazine, and interning on “the Hill” in the office of Sen. Elizabeth Warren (D-Mass.). But he said that it was the unexpected classes and experiences that shaped his career-focus. “My experience has been so much more than what I thought,” Mr. Barry said. “ I interned on the Hill, worked at The Globe for four years, learned to write policy and put my research and technical skills to the test as a junior. It all added up to my personal brand."